I might appear clumsy at times and to some people... often. But I promise for the most part, I'm not. And I certainly take good care of my stuff and have never dropped my phone or my tablet or my laptop [why does it feel like I might jinx it after saying that?]. So, when my tablet broke down I was devastated to say the least. The funny - not ha! ha! funny - way I found out there was something wrong with my tablet was when I felt a slight 'bzt! bzt!' when I was plugging the cable in with slightly moist hands, and discovered that there was a huge tear exposing the innards of the cable, which you can see in the photo. Prior to that, my tablet was 'waking up' constantly without me being anything near it - I even Googled the problem. The mistake that led to the tablet going bonkers was to tuck the cable underneath it while charging. I did so to prevent myself from snagging it and potentially knocking the tablet down. The cable is, interesting enough, more rigid than any other cables I have. I don’t know if this is exclusive to Samsung or particularly this tablet - which is a Samsung Note 8.0 - or not since I don’t have any other Samsung devices, but I believe it definitely contributed to the tear. As stated above, I have never dropped my tablet; and have never so much as to knock it around carelessly. For some reason, that made it more difficult for me to accept everything because all of those careful babying came to naught when I found out about the damage. The first day was relatively painless - for me that is. I couldn't send it for repair immediately. By the second and third day, I went through what akin to losing a family member - OK that is being overly dramatic, but once you have formed an attachment to someone or something, your brain will need time to adjust. At the time, I'd had the tablet for almost two years. The matter was made worse because my tablet was also my modem. I was using it to connect to the Internet and tether my laptop to do the same. Of course, I had my phone but there was nothing much I could do with my phone that could replace half of the function of my tablet. What I was most worried about was that I might lose all the files; I had some backed up but a lot of them were not. After a few days of waiting and a few days of... more waiting, the tablet was finally fixed... kind of. Cue in a sad song. 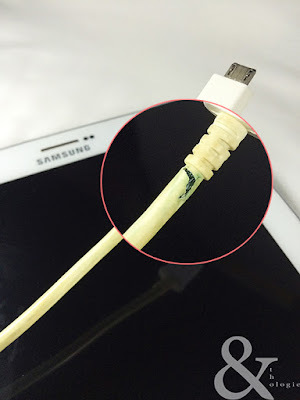 Up to a few months prior to the cable incident, I never really appreciated the stylus pen [or the S Pen according to Samsung], which comes with all the Samsung Note series. I thought it was quite useless. I did buy the tablet for the pen thinking that I might use it to do some sketching but I never really got used to the way of sketching digitally and basically gave up. Until, as I said, a few months before the tablet broke; I took a few online courses and was using the Samsung Note as it was mainly intended for - which is to take notes - and quite liked it. And then of course you know what happened. The tablet is now working but not quite itself. After the repair, I was told that to make the tablet 'right' again I might have to fork out what might cost close to buying a new tablet; even then there would be no guarantee. I decided to leave it as it was. I now only use it lightly. There’s a problem with charging, and taking notes now put a strain on the Note. It’s been treating me like a moody boyfriend: talking to me when he feels like it and ignoring me whenever he pleases. But, just like any long-term relationships, you [supposedly] figure out what makes your partner tick; I have figured out when to charge it and the don'ts. I can still use my tablet to play Candy Crush and read ebooks, and check my emails. As for being a modem, I have passed that responsibility to this little modem [that's another long read]. I love my tablet even if it doesn't play well with my MacBook; it's the right size, it's got a pen, it's thin-ish, it's my tablet. And for the record, I got the GT-N5100 model [Amazon | eBay]. How frequently do you check your cables for faults?